Rookery Waters is starting to draw in some big names for their Saturday qualifiers for the £1,000 grand final. In the latest match fished on the Magpie Pool first place went to Steve Clark, who drew peg 34 and put 137lb 14oz to the scales. Second was Jimmy Brooks on 116lb 14oz followed by Tom Edwards with 105lb 8oz. 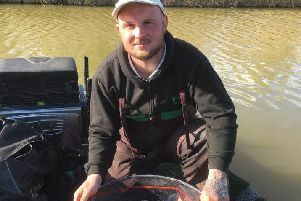 In the Thursday qualifier, again fished on the Magpie Pool, local rod Steve Dorks topped the field with a massive 215lb 2oz of carp taken close in and feeding heavily with red maggot. Another angler who always does well at the fishery is Kevin Peacock and he took the runner-up spot. He fished meat and paste for 146lb and was followed by Jim Garrity on 140lb 8oz. In the Oakham AC match fished on the Cedar Pool at Decoy Lakes it was city rods Dave Thornton, Dave Rowell and Dale Stones who filled the top three places. First was Thornton with a fine 170lb 4oz taken from peg 26 on pellet. Then came Dave Rowell on 101lb 12oz followed by Dale Stones on 92lb 15oz.